13 April 2007 - This is something we're still working on - and it's the BEST game of Cluedo ever! Steve Page from Cincinnati got in touch with us via the Chat Board on this website. His parents live in Saltair, Ohio - where Steve grew up - and the legend goes that this Saltair, Ohio, USA is connected with our Saltaire, Yorkshire, England. Steve's Mum and Dad live in an old house house built the 1700s by a man from England called Edward Salt, though our Saltaire didn't come into being until 1850, when the land was purchased by Sir Titus Salt to build Salts Mill and the village. Is it possible there's a family link between Edward Salt and the Salt family in Yorkshire? 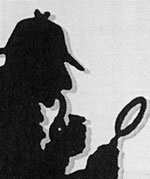 The Saltaire Sleuths (aka the Saltaire Boffins) are on the case - and if there's a connection, surely they'll ferret it out. We'll post our findings on the site as we go along. Below are links to everything we know so far.... Feel free to help us unravel this mystery! Steve Page tells us what he understands about Saltair, Ohio. Dave Shaw's rallying call to the Saltaire Sleuths.All these files listed below have been sent to us by Steve Page. They are Acrobat files and some are quite big.